How far is SolarCity falling behind? SolarCity spent its way to explosive growth, becoming America's top residential solar installer. But after it was acquired by Tesla, installations trailed off. Now its chief competitor, Sunrun, is about to take a top spot in the rankings of third-party solar financiers. In the newly released report, U.S. Residential Solar Finance Update, H2 2017, GTM Research predicts that Sunrun will overtake SolarCity as the top third-party ownership (TPO) financing provider in the residential solar market by late 2017. It's been a tumultuous year for the residential solar industry. Three of the largest installers, including NRG Home Solar, Sungevity and Direct Energy Solar, have gone bankrupt or exited the residential space. Since struggling SolarCity was acquired by Tesla, its residential business has dwindled. But Sunrun, which has seen moderate and consistent deployment growth over the last few years, filled the gap. It shows that struggles in the residential solar industry may stem from company-specific failings, rather than industry-wide forces. 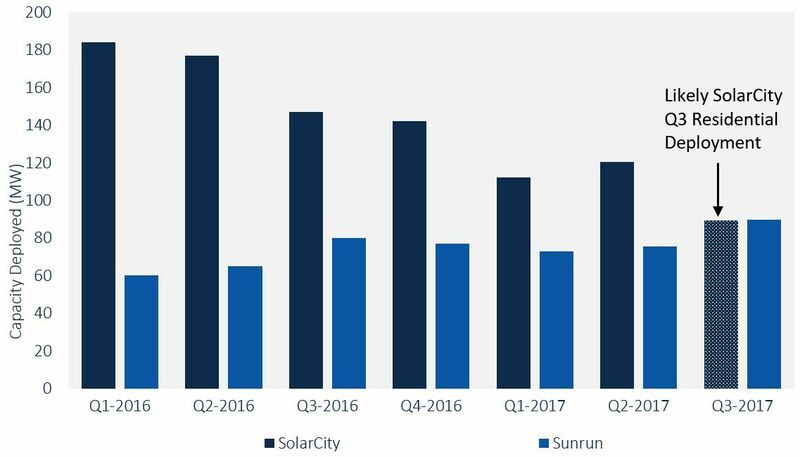 As a residential lease and PPA provider, we know from Q3 earnings presentations that Sunrun has already surpassed SolarCity based on capacity financed so far in 2017. 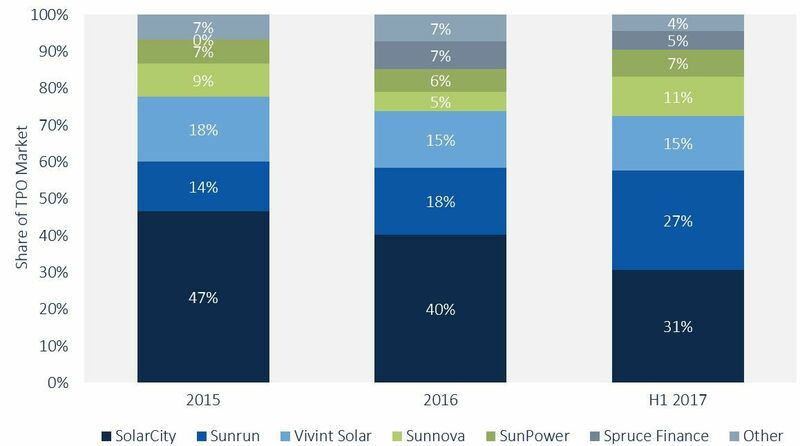 Through the first half of the year, Sunrun narrowly missed the top spot in the TPO market with 27 percent market share -- up considerably from its 18 percent market share in 2016, but just behind SolarCity’s 31 percent share. That 4 percent difference between SolarCity and Sunrun equated to just 19 megawatts over two quarters. In Q3, Sunrun financed 80 megawatts of systems, while SolarCity financed no more than 59 megawatts (a ceiling, as some of SolarCity’s systems were from its commercial business) -- a difference in Sunrun’s favor of more than 20 megawatts. Of course, there are other ways to look at the market outside of which companies are financing systems. Much of SolarCity’s fall as a top residential financier was due to its deliberate pivot away from TPO financing in order to increase its cash position. Today, nearly half of SolarCity’s systems are sold for cash or loans, and this pivot is inextricably linked to loan provider Mosaic’s prominent position in the loan market. But if we look at the residential market by total deployments (including leases, PPAs, loans and cash sales), Sunrun likely surpassed SolarCity as the leader in the space for the third quarter of 2017. According to GTM Research's residential solar financing analysis, SolarCity deployed 233 megawatts of residential solar in H1 2017, Sunrun deployed 148 megawatts, and Vivint Solar deployed 93 megawatts. Yet in Q3 2017, these companies deployed 109 megawatts, 90 megawatts, and 47 megawatts, respectively (SolarCity’s 109 megawatts includes its commercial business). So if 18 percent or more of SolarCity’s Q3 installations were in its commercial business (which is reasonable given SolarCity’s historic channel mix), then Sunrun would have narrowly out-installed SolarCity in the quarter. Both SolarCity and Vivint have endured high customer acquisition costs as mature markets become oversaturated. The companies have been forced to scale back operations in unprofitable markets. SolarCity dropped its door-to-door sales channel and instead is focusing on acquiring customers through digital leads. Vivint Solar, which has traditionally relied primarily on door-to-door sales, added retail sales to its mix. While these customer acquisition strategy changes are aimed at bringing costs down in the long term, the slow-moving transition to these new strategies has a short-term effect of increasing costs and decreasing sales. Equally important, both SolarCity and Vivint Solar have made concerted efforts to increase cash and loans sales as a portion of their product mixes. While the companies make better margins off their TPO products, years of selling leases and PPAs (where the companies receive payment from the customer over a 20-year term) have left both companies in dire need of cash in the near term. Cash and loan sales allow the installers to realize immediate payment for systems they install. But even this change comes at a cost. SolarCity and Vivint Solar employ salespeople who have been selling leases and PPAs for more than 10 and five years, respectively. The transition to selling loans has been difficult on sales teams that are forced to change their long-honed pitches, contributing to sales declines at these companies. While nearly every other large national installation company has struggled to grow this year, Sunrun is a standout. Unlike its largest competitors, Sunrun has seen customer-acquisition costs come down in recent quarters. And unlike SolarCity and Vivint Solar, Sunrun services the market through its direct installation business and through leases and PPAs delivered via its dealer network. By utilizing a dealer network to deploy systems, Sunrun is able to grow alongside the long tail of installers. Although not all long-tail installers are growing, Sunrun’s stringent vetting of installer partners weeds out the weaker installation companies that are more likely to suffer through bust cycles. Lessons learned from 2017: Is the residential solar financier shakeup here to stay? 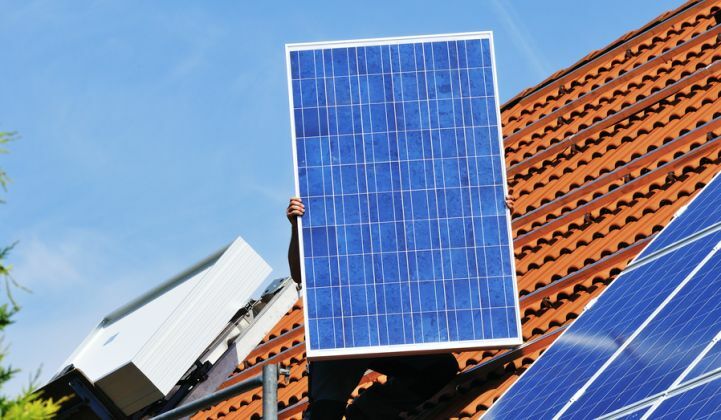 As SolarCity and Vivint Solar have deliberately scaled back operations and moved away from employing a strictly vertically integrated installer and financier model, Sunrun has jumped on the opportunity. Unlike its competitors, Sunrun continues to primarily sell TPO systems through its direct sales and installer network businesses. But recent success for Sunrun does not guarantee continued success. While Sunrun is now the leading TPO financier in the residential solar market, questions remain about the size of the addressable market. As the residential market grows into the future, GTM Research expects the TPO market to stay relatively flat through 2022, putting a ceiling on what Sunrun can address. The current transition of the market away from TPO -- which, according to GTM Research, will make up just 37 percent of the residential market in 2017 as compared to 53 percent in 2016 -- is primarily due to what leading installers are choosing to sell. There is downside risk to the size of the addressable TPO market. As residential system costs continue to decline, consumer-driven demand for TPO financing could become a prevailing force squeezing that market, leaving Sunrun behind the curve. There is certainly ample opportunity for Sunrun to increase its market share with leases and PPAs, but the company has little room for error in a market with a low ceiling. Allison Mond is a solar analyst with GTM Research. Read the residential solar finance update here.